By definition, ground covers are plants – often creeping, spreading or climbing – that top out at 3 feet (91 cm.). Perennial ground covers are often used as an alternative to grass. They are low-maintenance plants that provide excellent erosion control, even on steep slopes or other difficult sites. Many do well in shade. 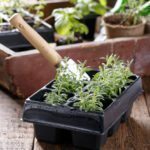 It may seem that selecting ground cover plants for zone 9 would be easy, but finding suitable hot weather ground covers can be tricky because many ground-hugging plants don’t tolerate intense heat. If you’re in the market for zone 9 ground covers, read on for a few suggestions. Below you will find some zone 9 ground covers suitable for your landscape or garden. Algerian ivy (Hedera canariensis) – This ivy plant prefers any well-drained site in deep or partial shade. Note: Algerian ivy can become invasive in certain areas. Asiatic jasmine (Trachelospermum asiaticum) – Also known as yellow star jasmine, this ground cover prefers rich, well-drained soil in partial shade to full sun. Beach morning glory (Ipomoea pes-caprae) –Also known as railroad vine or goat’s foot, this morning glory plant enjoys nearly any soil, including poor soil, and full sun. 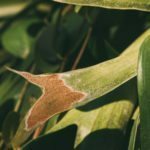 Coontie (Zamia floridana) – Also known as Florida arrowroot, you can plant this ground cover in sun or shade in any well-drained site, including poor soil. Creeping juniper (Juniperis horizontalis) – Creeping juniper is a popular addition to many landscapes as an attractive ground cover. It tolerates any well-drained soil and prefers full sun. Liriope (Liriope muscari) – Also commonly called monkey grass or lilyturf, this attractive ground cover makes an exceptional addition to the landscape and is even used as an alternative to grass. 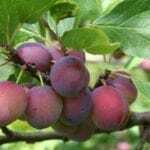 It prefers average, well-drained soil in partial shade to full sun. St. Andrews Cross (Hypericum hypericoides) – Plant this variety of St. John’s wort in moist or dry soil. As long as it drains well, the plant should be happy. Tolerates full shade to full sun. Golden creeper (Ernodea littoralis) – This ground cover prefers coarse, sandy soil in areas of light shade to full sun. 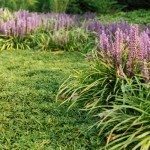 Mondo grass (Ophiopogan japonicus) – Similar to liriope and also known as dwarf lilyturf or dwarf liriope, mondo grass makes an excellent round cover option for zone 9. Give it moist, loose soil in either partial shade or full sun locations. Love grass (Eragrostis elliottii) – Ornamental grass is a popular choice for the landscape, especially those that provide ground coverage like love grass. This plant prefers areas that are well drained in light shade to full sun. Muhly grass (Muhlenbergia capillaris) – Also known as pink hairgrass or pink muhly grass, this is another ornamental grass often used for ground coverage. While it enjoys full sun locations, the plant prefers moist, well-draining soil. Blue porterweed (Stachytarpheta jamaicensis) – Nearly any well-drained soil will accommodate this ground cover plant. It also tolerates partial shade to full sun areas, and butterflies will love the brilliant blue flowers. Butterfly sage (Cordia globosa) – Also known as bloodberry sage, this is a good ground cover plant for areas with poor soil. It tolerates partial shade to full sun conditions. This plant is another great choice for attracting butterflies. Perennial peanut (Arachis glabrata) – This isn’t your average peanut. Instead, perennial peanut plants provide optimal ground cover in well-draining sites with full sun. Bugleweed (Ajuga reptans) – If you’re looking for something attractive to quickly fill in a large area, then ajuga is definitely a good choice. While its foliage is the main attraction, the plant also produces bee-enticing blooms in spring. It prefers nearly any well-drained soil in light to full shade, although it will tolerate sun. Autumn fern (Dryopteris erythrosora) – Autumn fern plants will fill the area with beautiful bright green fronds. Since it’s a woodland plant, locate this fern in a well-draining spot with plenty of shade.